iOS & Android Updates – Zombies, Run! It looks like you made it onto the “nice” list this year, so you’ll find some neatly-wrapped Zombies, Run! updates nestled under your tree. Beta testers have been putting the new iOS update through its paces, but now it’s ready for everyone to use. We have the all-new mission progress bar which will tell you how far through a story mission you are and how many supplies you’ve collected. We’ve also included improvements to zombie chases and lots of bug fixes to make the app better for you. 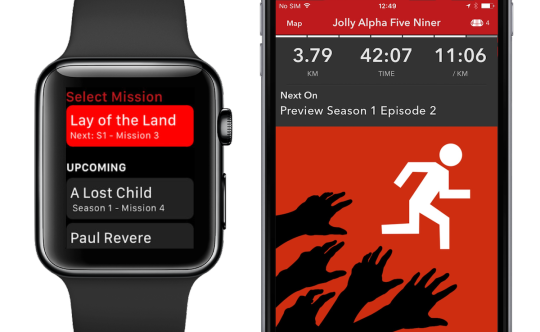 Our new Apple Watch app will now stay on display while you’re on a run, so you can check your run progress and supply count at a glance! You’ll also be able to access a list of missions, instead of just the next one, and you’ll see that we’ve added a load of UI and run info improvements. This update includes general performance and UI improvements, as well as some bug fixes. This means you’ll be getting the most stable version of Zombies, Run! Grow up to be a hero and a Runner?